In June of 2005 I bought a 34' 11yr old Allegro Bay motorhome so the Macaws could travel with me. Have managed to go on a couple of trips, but have spent most of my time remodeling inside and outside as well as making improvements to the engine. Here are some of the pictures of the process. Original pink, foo foo bedroom. Not my style and pretty tacky with age. Hi! I'm a member of The Perch Parrot forum & came across these pics. I took special notice of them as my hubby is hoping to buy an RV when he retires so that he & I & my birds & dog (& other family of course) can do some traveling & get away from the cold winter weather here in Nebraska! Right now we're just in the thinking stage of the plan & looking at some of the options. 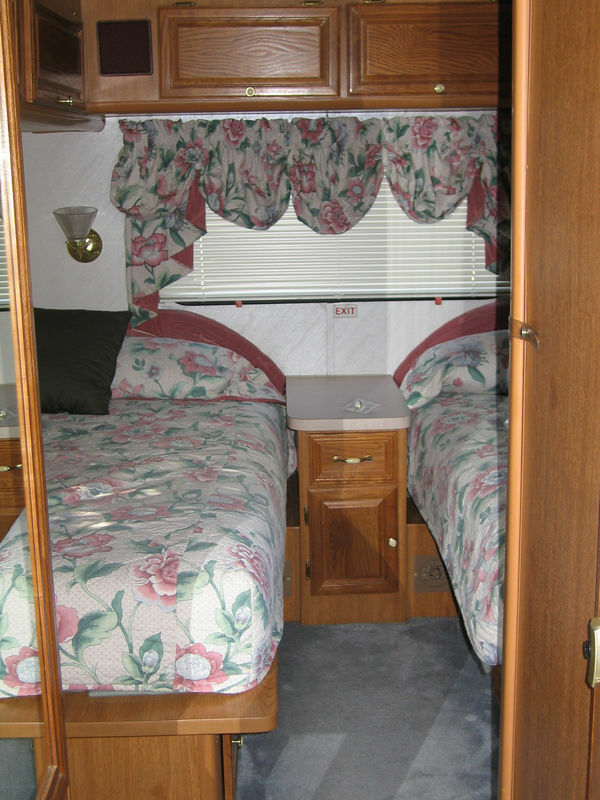 His brother has a very nice RV that looks very similar to yours, except his has 1 large bed in the bedroom, hubby & I have stayed in it a few times while visiting them in San Diego & really enjoy it!